Why read about the news (or complain about the news) when you could help make the news? 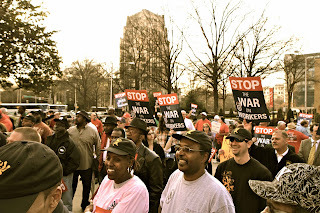 In the midst of a season of local, national, and global movement, AFSC is asking Atlantans this question. You can find out how to answer the call by attending our Volunteer Meeting on Thursday, March 3rd at 6:00pm at the AFSC office (60 Walton St, downtown near 5 Points Station). Migrant Youth Voice- AFSC’s Migrant Voices seeks to work alongside youth and community organizations to record and share the stories of undocumented immigrant youth across the United States. Some volunteer opportunities: Editing videos, outreach. Student Career Alternatives Program- (www.scapatl.org) SCAP is a career counseling service that promotes under-promoted, nonmilitary career options to high schoolers in metro Atlanta. Current projects include a youth art/writing/music/video contest, tabling at high school lunches and career fairs, and free SAT tutoring on Monday nights. Some volunteer opportunities: Promoting the art contest and helping at the awards ceremony, writing/art/graphic design for materials, tabling, and tutoring. Statewide work: We're trying to re-energize statewide activist networks. 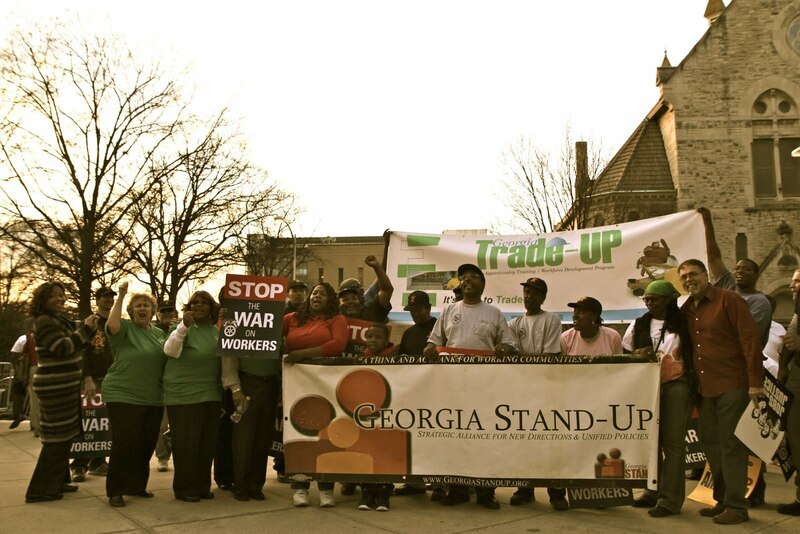 We need help mobilizing people outside Atlanta, especially during this legislative session! Some volunteer opportunities: phone calls, networking. Be The Change Youth Convergence: This is an annual meet up for high school and college-age youth in Georgia to discuss the issues our state faces and build skills to confront those problems with solutions. We're looking at June 17-19 in Atlanta, so there's a lot of work to be done before then. Some volunteer opportunities: Event planning, graphic design, tons of outreach. See you Thursday, March 3rd at 6:00pm! Bring your friends! 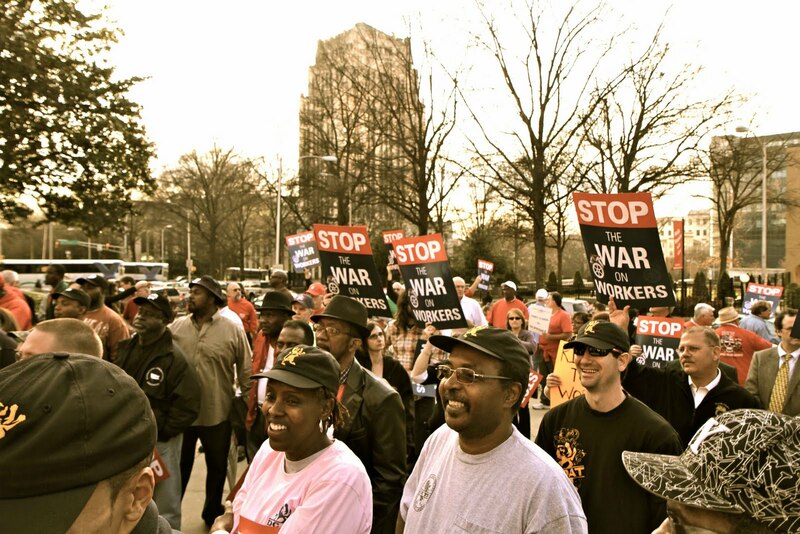 Today hundreds of people rallied at the steps of the capitol to demand a halt on the attacks against the rights of working people, no only in Wisconsin, but here in Georgia as well. The crowd was large, and very spirited. Scanning the crowd it was clear that the rally brought together folks from dozens of different organizations. Wisconsin may very well be the beginning of what some might call the awakening of a sleeping giant. That sleeping giant being the American working class. It's a cruel irony that the war's in Iraq and Afghanistan(fought by working class folks) have produced such enormous profits for several multi national corporations, and now the working class is having to foot the bill. A just reassessment of our economic crisis would put the military industrial complex on the chopping block first, followed closely by the prison industrial complex. 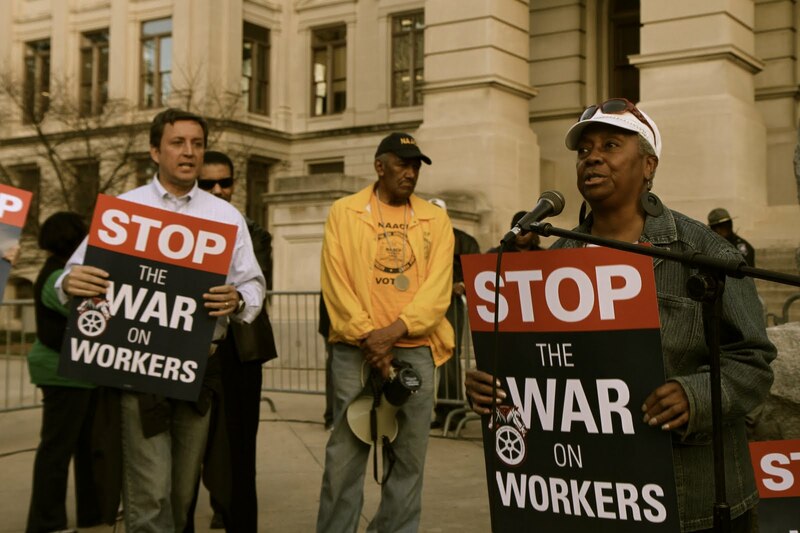 Instead law makers seek to defund schools, attack workers collective bargaining rights, and cut other programs of social uplift. The reality is that by cutting military spend by 1/3 and sending non-violent drug offenders to treatment instead of prison we would have plenty of resources. 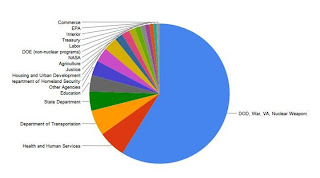 If the military budget was decreased by 1/3 we would still be more than outspending every other countries military and something must be done to address the phenomenal fact that the US has the largest prison population in the world; not per capita, just period. There's of course many other solutions to today's economic crisis of priority that don't include forcing kids and the working class to deal with problems that they didn't create. I hope that today's demonstration, and the increase in grassroots organizing that I've witnessed over the past six months, is the beginning of new alliances. I hope now the time is upon us where struggles will go beyond making the verbal/mental connections between the violent oppressive systems that control our minds, body's, and communities. Now is the time to make those connections physical, make them in the streets, in the churches, on the campus, and in our communities. Together we can create a choir so loud it's irresistible, impossible to stop, like a runaway train roaring towards an inevitable destination. Real change(no the fake kind you hear about when it's time to elect a new person). 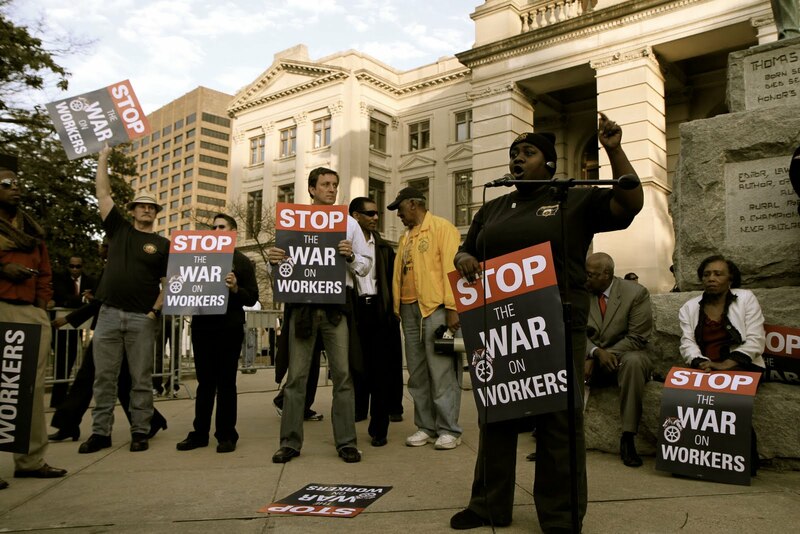 How should a statewide organization for peace and justice be structured? What capacity do you have in your area to act locally and participate effectively in the statewide organization? What can a statewide organization do to build your local capacity? Who are you? What you are working on? What you need help with? How you envision yourself connecting with others around the state? This is also your chance to make any announcements. 2:15-3:15pm What is GPJC? What do we want it to be? Function/ Purpose: What can GPCJ do for us? What can we do to make it the gpjc Georgia needs? 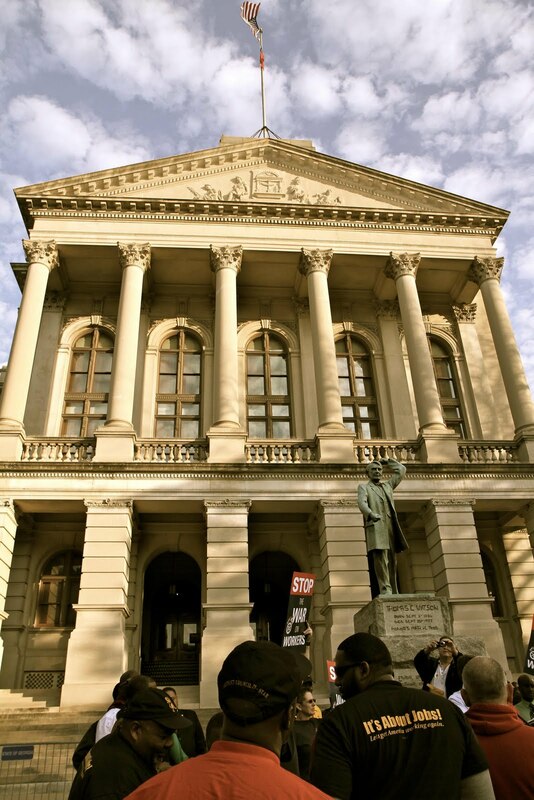 How to foster statewide participation and momentum. Students Prepare for "It's My Life" Art Contest! Today Josie and I headed out to one of our favorite schools in the metro area, Cross Keys, to talk with students about cool non-military post high school options. We also made sure to hype our 2nd annual, "It's My Life" Art Contest. Last year we received several submissions from Cross Keys Students and this year it seems like we'll be receiving even more. We had multiple students let us know that they have already been working on pieces to enter. We were even treated to a mini concert by an enthusiastic student that plans on winning the contest with a song he's working on. 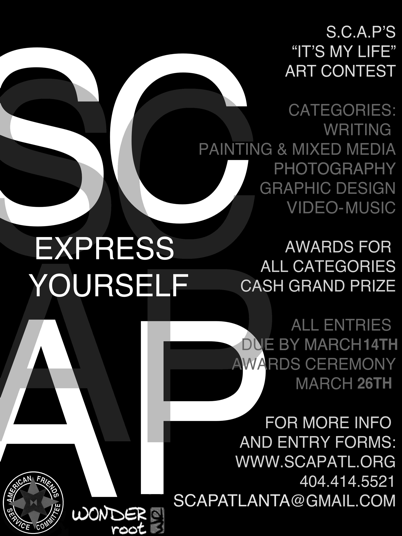 The deadline for submission is March 14th, so there's still time to enter something! Check out the this link for details about the contest! Today several of us spent some time at Dunwoody Georgia Perimeter College Campus talking to students about anticipated education legislation about to be introduced at the capitol this week. The legislation will likely require another round of tuition and fee hikes for all college students attending public universities. It would also divest 300 million dollars from k-12, shorten the pre-k day, and dramatically cut the HOPE scholarship. Students that we spoke to we very much aware of the personal costs of last years budget cuts but many were unaware of the implications the current purposed cuts would have on their pocket books and the low income k-12 schools. Almost every student was eager to sign one of our failing grade postcards, which we plan to hand deliver to the Georgia Senate in the next week or so. 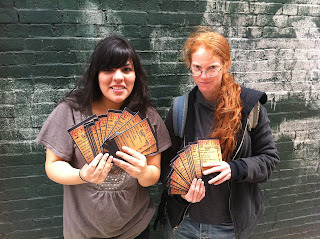 We were also excited to have a a large stack of report cards from Athens hand delivered by UGA student Allie McCullen! This is our last week push to get every card we got signed and back to our office so we can deliver them all at the same time. 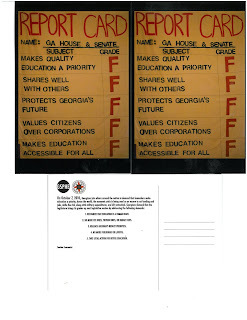 We'll have the cards at our downtown office, and we'll have them at the Georgia Peace and Justice Coalition Statewide meeting in Macon this weekend for those of you that haven't yet signed one! GA Immigrant Youth Speak Up! Migrant Youth Voice is a project of AFSC created to lift the often unheard voices of undocumented and latino youth into the public discourse on immigration reform. Too often we hear the pontifications of those who are unaffected by the immigration policy. Too often we are fed unrealistic fears paraded as truths by politians and pundits who seek to gain political capital. We hope to amplify the human voices who simply dream of having a lawful existence in the nation that they call home. This past Saturday we organized a youth conference in support of Migrant Youth Voice. Storycorps expressed interest in this national campaign and joined us to record interviews that would be considered for radio play on NPR. Youth came to participate in learning about current legislation, they came to share their stories and link the ties between how immigration policies have already been affecting their lives. Most importantly, these students came to be heard and begin to make a change. As these students shared their stories of facing racism and xenophobia it became clear that even at a high school age there is an understanding of what an undocumented student or peer is being deprived of. A lot of the undocumented students we encounter do not recall coming to the United States. This has always been their country. If these youth were to be deported they would be going to a country completely foreign to them. This is the reality that many undocumented students are living with. It is a fear of simply trying to make a life for themselves in a country that seems to be trying to criminalize them more and more. One young man specifically mentioned he and his family having to move out of a county that enforced 287(g); a law that gives law enforcement authority to use racial profiling and detain undocumented individuals for unspecified periods of time. We learned how all undocumented families are living in fear. “Ojale no me pare la policia”. This is one of the many, many reasons the kids came to share their stories. To put a face to who is actually being affected by these detrimental pieces of legislation. Students were inspired to film their stories anonymously. They were inspired to get involved and get others involved. Banners were made for GLAHR’s upcoming immigration march, discussions were had with the GADREAMERS to give kids a better understanding on local immigration issues. We had fun group exercises to get everyone working together and grasp the concept and importance of working with others to reach a desired goal for all. As we approached the end of the day, students were coming up to us asking when we could meet again. They are telling their friends and family members and they want to get their stories out there. They want a future for themselves and their families here in the U.S. and they are going to fight for it. The most important part of Migrant Youth Voice has been to inspire youth to be vocal on the issues that are affecting them and through this project to have achieved a sense of fulfillment and pride in themselves and their hard working immigrant families. We are so proud of you guys! And we can’t wait to share your stories with the world. Sexual assault at any time and under any circumstance is a horrible thing. On many occasions the victim not only has to deal with the trauma of the attack, but is also traumatized by the process through which they seek justice. It can be mentally and emotionally tasking for a victim pursuing justice through the civilian system of jurisprudence, and it can be even more tasking for those who are victimized by a peer or a superior in the United States military. In an effort to deflect criticism on this concern, the Department of Defense not long ago announced efforts to monitor the predatory elements within its ranks with more alertness and diligence. 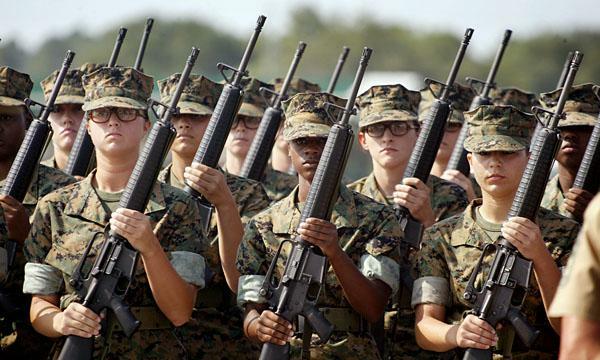 According to a March 2008 Department of Defense report tracking reported cases of sexual assault in 2007; one in three female soldiers will be the victim of sexual assault while serving in the military. This is in comparison to one in six women who will become the victims of sexual assault in the civilian population of the United States of America. "Women were raped on recruiting office couches, assaulted in government cars and groped en route to entrance exams,"
It is likely that many potential recruits will never know about this particular occupational hazard nor the related data associated with its pervasiveness throughout the military during their decision making process. Why? Because most military recruiters will not offer this as a point of concern for recruits to consider, most high school guidance counselors are unaware about this aspect of military life, and most parents of potential recruits are only told about the benefits of enlistment. Therefore it is more likely that a young person considering enlisting will only learn about how they will earn a steady paycheck, get great health benefits, be eligible to receive money for college, and receive job training. If the question about sexual assault is even presented to a recruiter it is likely that the recruiter will do the same shuffle recruiters have been caught on record doing when asked the question, “Will I be deployed to the war?” Thinking that a drill instructor, a commanding officer, or another enlisted member could be a potential sexual predator is not something that recruits are encouraged to consider. Yet, that understanding could be the very thing that helps them to make a truly educated decision. 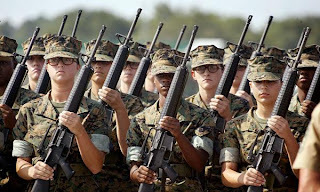 The Department of Defense report also mentions that each of the service branches are charged with aggressively working on this issue, however, the hyper-masculine culture of the military makes is partly responsible for the difficulty victims have to deal with and also makes it possible for those who commit sexual assault to get away with it. It is not easy to clean up a culture of impunity and the reality is that the Department of Defense only started its tracking program in 2006 after Congress ordered it to address the situation. While some elements of the top military brass may authentically seek to alter the reality for women in uniform the fact remains that about 80% of rapes in the military still go unreported. Many victims do not report their assaults for a variety of reasons some of which include the shame they feel, or because they think they know enough about their chain of command and the reporting process to conclude that they might not be believed, or worse. In the case of the military, it is the commanding officer of the service member who makes the decision whether or not a criminal case can be brought against the accused. This reality gives commanders a wide range of discretion and, recognizing that there still exists an “old boy network” in the military, it is not a stretch for commanders who are sympathetic to the accused to become an obstacle in the pursuit of justice. Some victims are also aware that most allegations which actually are investigated never wind up with the accused facing a court-martial. In 2008 there were 2,923 reported sexual assaults of which 2,763 were investigated yielding only 317 court-martials while in 2007 of the 2,200 service members who were investigated only 181 were dealt with via a court-martial. The Pentagon considers the increase in court-martials to be progress, but the most staggering statistic in the reports is not one that is very high in comparison to the other statistics; 251 incidents of sexual assault occurred in combat areas. Considering that youth are inundated with recruiting messages about honor, duty, and serving one’s country via the military it must be incredibly challenging for a young woman raped in a combat zone to then process the difference between the enemy she is told to fight and the enemy who wears the same uniform she does. While many are coming back from their deployments afflicted with Post Traumatic Stress Disorder because of their exposure to war we don’t pay enough attention to those coming back from those same war zones with PTSD because they have been physically traumatized by a colleague. Though the challenge of keeping quiet may ultimately add to the stress a victim has to endure and possibly even put them at risk of other attacks, it could seem like practical, common sense to not report a crime just so that the victim can attempt to jump over career related hurdles with more ease. Enough victims of MST in the military know stories like the one Christine Hansen testified to and think better of reporting an assault assuming that it would only make things worse then they already are. To underscore this reality, only one of the plaintiffs in the MST class action lawsuit is still in the military. The other seventeen plaintiffs are all military veterans. Another major hurdle for victims of sexual assault in the military is the lack of support they receive from their service branches and the Veterans Administration. Currently, there are not many medical therapy options provided by the Veterans Administration for service members suffering from the after shocks of a sexual assault and what does exist is difficult for affected service members to find. Comprehensive medical and psychiatric treatment often doesn’t occur while still serving in the military if the crime has not been reported and while there are many reasons why a victim may choose not to report an assault a big reason is because the victim may not want the medical psychiatric treatment showing up in their military record. Medical and psychiatric records are taken into account when a service member is considered for promotion, or a higher grade of security clearance. Those who visit a mental health professional through military channels can have their consideration for promotion withdrawn, or their existing security clearances revoked. Those who understand the culture of retaliation in the military and are aware that receiving medical services could be an obstacle to career advancement will likely avoid the healthcare opportunity even if it means they receive no justice and no structured healing process. President Obama’s budget proposal, due Monday, will touch off Washington-centric squabbles over proper levels of federal spending and taxing. Snooze-inducing terms like “continuing resolutions,” “discretionary spending,” and “entitlement spending” will dominate political debates all the way through the presidential caucus/primary season to the 2012 election. In the rest of the country, people would prefer a straightforward response to the unemployment and foreclosure crises that are prompting talk of states declaring bankruptcy. One answer is staring us in the face: Put cutting the “national security” budget back on the table. That’s a key step for President Obama and Congress to fulfill their constitutional obligation to “promote the general welfare” - and to protect vital programs, like food and housing assistance, for our most vulnerable neighbors. People across the country are watching relatives, friends, and coworkers struggle with unemployment and under-employment at levels which make claims of an “economic recovery” laughable. In my state of New Hampshire, homeless shelters that were already full before the economic collapse are seeing increasing numbers of first-time visitors. The average length of a shelter stay continues to rise from 51 days in 2009 to 55 days in 2010 because there simply are not enough decent jobs or apartments with affordable rents. Nationwide, the number of low-income households who had to pay more than 50 percent of their income for housing went up by 20 percent in the past two years. But instead of recognizing this housing emergency, budget hawks in Washington are letting their obsession with deficits cloud common sense. For example, the House Appropriations Committee is proposing a 17 percent cut in the housing budget. That would mean that hundreds of thousands of poor families whose rent is subsidized with public dollars will lose their homes. That amount - $708.3 billion - equals the combined military spending of nearly every other country, many of whom are our allies. Why continue this bloat, especially in the face of continued and growing human needs at home? Instead, Congress and the President should join forces to put America back to work, even if investments in education and infrastructure cause short-term deficits. Money in the wallets of low income and working class people is the best recipe for raising demand and producing economic growth. Finally, we need to look at our tax system. Given the fact that most of the benefits from economic growth in recent years has gone to the wealthiest among us, it is reasonable to let the Bush era tax cuts expire for those at the top of the pile. Congress also should give attention to closing corporate tax loopholes, which the President’s deficit commission calls a significant leak in the federal coffers. The President’s budget director says the budget is “an expression of our values and aspirations.” That’s a good place to start, and a good place to return. Arnie Alpert is New Hampshire Program Coordinator for the American Friends Service Committee, a Quaker organization that works for peace, social justice, and nonviolent change. For confirmation, call (603) 224-2407. It’s simple math: A military budget that has doubled in twelve years + worries about the resulting deficit = deep cuts to military spending. Yet in a display of backward logic, the House majority’s initial announcement of planned cuts to current spending only included cuts to non-military discretionary spending, the spending that helps invest in our communities, schools, and our economic infrastructure. It seems the Pentagon has developed the ultimate cloaking mechanism -- to protect military budget bloat from mathematical reality. The US military budget currently accounts for over half of our discretionary budget -- and nearly half of all military spending the world over. Despite this incredibly lop-sided investment, increased military appropriations are set to glide past Congressional “budget hawks” like Harry Potter in his invisibility cloak. Meanwhile the fragments of federal funding which would address human needs, long-term infrastructure, or non-military actions in the world are scrutinized down to the dollar – at a time when the number of Americans in need is growing with every lost job or home foreclosure. Reducing government spending by shrinking investments in our long-term well-being rather than cutting the military budget is as sensible as dieting by cutting back on salad while eating three desserts a day. 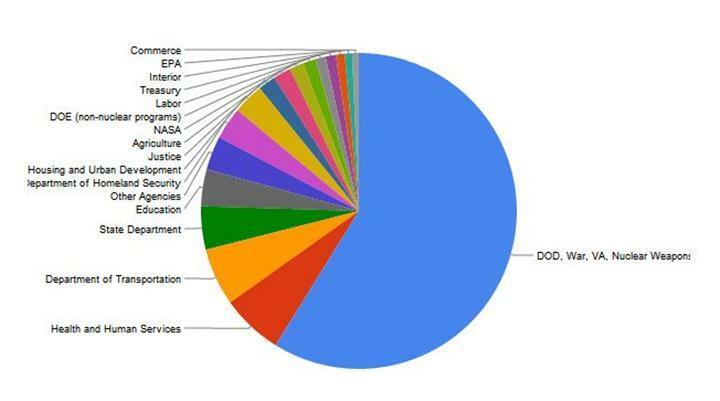 Even cutting nearly a trillion dollars out of the defense budget over the next ten years—a sliver off that third dessert— would leave us spending 14 percent more than we did during the Cold War era, according to analysis by the Sustainable Defense Task Force. Yet the measure the House will consider this week for FY 2011 funding would cut just 2.8 percent from the president's FY 2011 defense budget request, compared with 20.6 percent from the budget for non-military foreign operations. Under this proposal the “Defense” budget will still increase by $8.1 billion dollars from the previous year. We invest tax dollars in a shared safety net so it will be there to catch us during hard times. In our current slow-grinding economic crisis, more Americans have fallen into poverty, needing help with things like food and housing. The fact that the burden has increased on such programs as low-income housing and preventive health care clearly shows they are needed more than ever, not that they should be taken away. 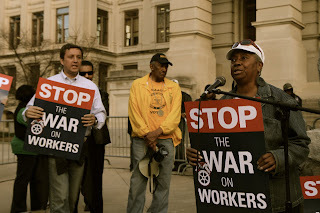 Jack Lew, the Director for the White House Office of Management and Budget, writes that, “the sacrifices needed to begin putting our fiscal house in order must be broadly shared.” Yet all the cuts being proposed this week in Congress hit low- and middle-income families and communities the hardest. Lew says the easy cuts are behind us. But simple math above says we have yet to seriously consider them. It’s time to pull back the cloak and make budget cuts where we need them most: in our off-the-charts military spending habit. Robin Aura Kanegis serves as Director of Public Policy and Washington Office for the American Friends Service Committee (AFSC), a Quaker-based organization working for peace, social justice and nonviolent change. She provides strategic direction for all aspects of the organization’s engagement with Congress and the Administration. Visit AFSC at www.afsc.org. 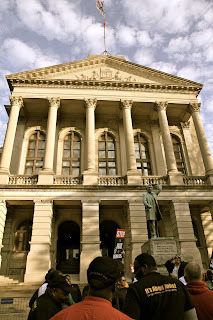 Holocaust Survivor Hajo Meyer Speaks In Atlanta! Atlanta Makes Even More Noise For Egypt!! Updated, "Before You Enlist" DVD's Arrived Today!